All Miracle II Soap orders ship vis UPS ground within 1 to 2 days directly from the Manufacturer in West Monroe, LA. Contact Us for: Case Pricing/Wholesale Pricing; 2X Strength and 3X Strength Soap/Neutralizer Liquid; and 7X Strength Neutralizer Gel. 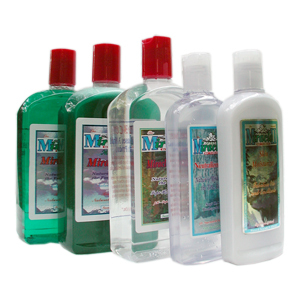 101 Miracle II Regular Soap 22 oz. A biodegradable, non-toxic soap gentle enough to bathe a baby yet powerful enough to wash your car! Highly concentrated so you control the strength! It is made from all natural ingredients that will clean and deodorize. Can be used for personal hygiene care or cleaning household items, even degreasing. It's great for your pets too. Kills fleas on contact without any pesticides. A biodegradable, non-toxic soap gentle enough to bathe a baby yet powerful enough to wash your car! Highly concentrated so you control the strength! The Miracle II Soap is a biodegradable, non-toxic soap used for just about anything. The concentrated formula is made from all natural ingredients that will clean and deodorize. Can be used for personal hygiene care or cleaning household items, even degreasing. It's great for your pets too. Kills fleas on contact without any pesticides. 201 Miracle II Moisturizing Soap 22 oz. The Miracle II Moisturizing Soap is regular soap formulated with added moisturizers (apricot, almond, olive and coconut oils) so it is great for those with dry skin. Ingredients: Eloptic energized oxygenated water, ash of dodecyl solution, dehydrabiethylamine, calcium, magnesium foaming agent, cold pressed apricot, almond, olive and coconut oils, vitamin E.
501 Miracle II Skin Moisturizer 8 oz. Miracle II Moisturizer is quick-absorbing and non-greasy. Made with fabulous oils and emollients to leave the skin looking and feeling soft and healthy. No preservatives added. Ingredients: Eloptic energized stabilized oxygenated water, cold pressed apricot, almond and coconut oils, and vitamin E.
502 Miracle II Skin Moisturizer 22 oz. Miracle II Moisturizer is quick-absorbing and non-greasy. Made with fabulous oils and emollients to leave the skin looking and feeling soft and healthy. No preservatives added. Ingredients: Eloptic energized stabilized oxygenated water, cold pressed apricot, almond and coconut oils, and vitamin E.
401 Miracle II Neutralizer Gel 8 oz. The Miracle II Neutralizer in a concentrated gel. Apply to minor scrapes and abrasions to promote a speedy recovery. Also can be used on sore muscles and to reduce the appearance of wrinkles and fine lines. Soothes sunburn and speeds healing. Since this product is made from organic ingredients, suggested use is within one year from manufacturing date on bottle. 402 Miracle II Neutralizer Gel 22 oz. 301 Miracle II Neutralizer Liquid 22 oz. Miracle II Neutralizer is used as topical solution to aid in toning the skin. Used for sunburn, scrapes, abrasions, etc. Makes 1 Gallon of Neutralizer. A great affordable way to give the 5 essential Miracle II products a try! The best way to try it all!! The Miracle II Thai Deodorant Stone is 100% natural--does not contain any harsh chemicals, perfumes, oils, emulsifiers, alcohol, or propellants. Made from potassium sulfate and other mineral salts. The stone is crystallized then hand shaped. The deodorant stone is not sticky or greasy, will not stain clothing, or irritate your skin. No Aluminum Chlorhydrate. The Miracle II Laundry Ball replaces your normal laundry detergent by cleaning your clothes naturally. 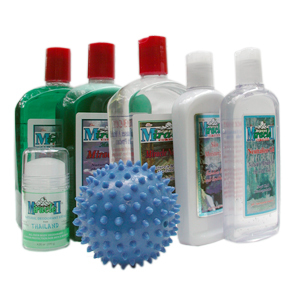 The Laundry ball is filled with Miracle II Soap and Neutralizer. Just pop the ball in the washer and let it go to work! The 209 rounded spikes all around the outside of the ball gently scrub and massage your clothes with loving care. Pretreat stains with Miracle II Soap. For clothes with grease on them, use an extra half ounce of Miracle II Soap with the ball. No need for anti-static solutions. 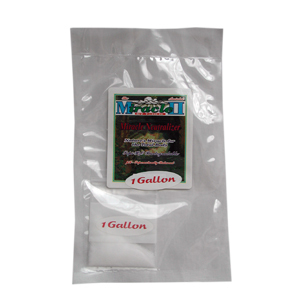 For fabric softening, just add a little Miracle Neutralizer in your wash. Can be used for years and has a 3 year replacement guarantee, Miracle II LLC, warranty. Just keep the ball out of the dryer and away from the dog and cat!